The University of Toledo community may have noticed a different type of bus on campus lately, and that’s because UT is now a stop for megabus.com. 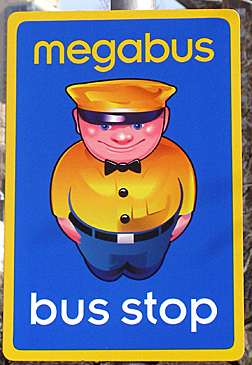 With fares starting at $1 plus reservation fees, megabus.com is more affordable than most other bus companies. Fare prices vary based on the time seats are purchased; as more seats are reserved, prices increase. Megabuses also offer guaranteed seats, free Wi-Fi, electrical outlets, no middle seats, and the inclusion of a carry-on and up to 50 pounds of luggage at no cost. Each bus also is green-certified and runs on biodiesel fuel. From lot 23 on the Scott Park Campus, passengers can travel to Chicago, Cleveland, New York City and State College, Pa. From those cities, passengers can purchase tickets to more than 120 additional U.S. locations through approved connections found on megabus.com. For exclusive information on fares, booking dates and contests, follow @megabus on Twitter or like megabus.com on Facebook at facebook.com/megabus.com.officialpage. To purchase tickets, visit megabus.com. This entry was posted on Tuesday, April 29th, 2014 at 2:58 am and is filed under News, UToday .